Why the triple alpha process appears so unlikely, but is absolutely vital to our existence. 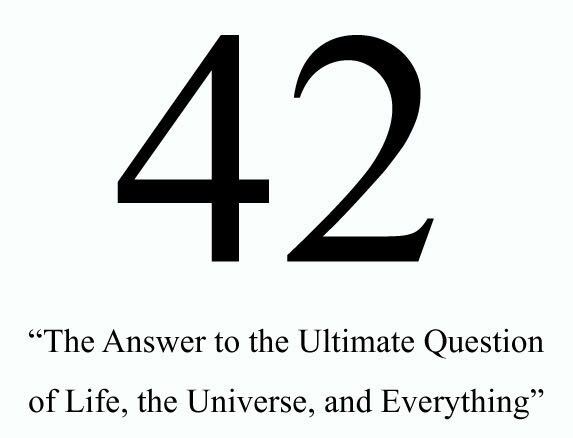 In Douglas Adam’s remarkably clever and entertaining sci-fi-philosophical comedy, The Hitchhiker’s guide to the Galaxy, the solution to the most profound and vexing of problems, the ultimate question of Life, the Universe, and Everything turns out to be “42”. Unfortunately, that answer didn’t seem to really satisfy any of the characters in the story, and simply brought increased puzzlement and confusion. Does that mean that there is no answer, or that we aren’t intelligent enough to understand the answer, or as Deep Thought, the super computer in the Hitchhiker’s guide points out, that we haven’t really figured out how to ask the question in the right way, so the answer churned out will be obviously incoherent? I think that almost all of us have a deep desire to understand something a bit more about Life, the Universe, and Everything, than we know right now, but just like Douglas Adam’s hyper-intelligent pan-dimensional beings, we don’t really know where to even start asking the question in a formally logical and structurally coherent way. If a hyper-intelligent species can’t even figure out how to do it what chance do we have to get it right? One thing that seems clear is that humans have been trying to figure out their place in the cosmos for a very long time. Even in prehistoric times there is evidence for a developing concept of the supernatural, suggested in artifacts and signs of ritual. It is easy to to imagine early humans during the last ice age feeling tiny and afraid in a big world of danger and death, wanting desperately to gain an edge by understanding the world just a little better. And thanks to human intellect, our early ancestors did learn important facts about the world that helped them to survive, such as learning about the seasons, migration patterns of large herd animals, how to identify stones that can be crafted into technology, and so on. Some things remained a mystery, such as where all the humans originally came from, how the world was created, and why everyone eventually dies, so myths were invented to answer these important questions. Jump forward 50,000 years, and we humans managed to survive against odds, not due to strength, but due to intellect and the fierce instinct to reproduce. Today we know a lot more about the universe, thanks to the development of science over the last 400 years, but as the frontiers of science are pushed ever outward, we still stumble against the age old questions of Life, the Universe, and Everything. How did we get here and what is it all for? To illustrate why it may look like the universe was specially made for us, I want to describe the triple alpha process, which is really a cool thing to know about in its own right, but also because it is a feature of our universe that theists commonly use to justify the concept that the universe has to have been fine tuned in order for us to be here. The triple alpha process (also known as the Hoyle resonance) is the mechanism by which carbon is produced in the universe. Carbon is pretty important for us earthlings since all earth life is carbon based. From the carbon in our DNA, to the that in our proteins, carbohydrates, and lipids, carbon is our most important building block for making a living thing. Based on the chemical properties of carbon, it seems to be the most likely element to play the staring role featured in the movie of life across the universe. Any other potential candidate atoms (such as silicon – see my blog post from June 18th, 2015 on the implausibility of silicon based life forms) don’t appear to have the versatility necessary for the complexity of chemical reactions we call life. The carbon in our bodies, in all living things, and in the environment in the form of carbon dioxide in the atmosphere or carbonates dissolved in the oceans, was not produced in the big bang. The big bang occurred about 13.7 billion years ago, and in the intense temperature and density all the primordial hydrogen and helium was created, with a trace amount of lithium and a few other elements. Carbon is the fourth most abundant element in the cosmos today, so it had to be produced through another route. That route involves its synthesis inside of hot dense stars. Main sequence stars like the sun are busy fusing hydrogen into helium. This process ultimately takes four hydrogen nuclei (protons) and with the temperatures and densities achieved in the core of stars fuses them into a helium nucleus (two protons and two neutrons represented as He-4). 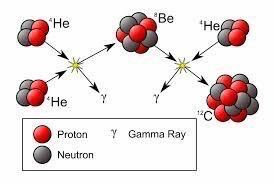 During that process energy was released in the form of gamma rays as two of the protons were transformed into neutrons, with the small mass difference (protons have slightly more mass than neutrons) being converted to energy. The gamma rays continue to be absorbed and reemitted at slightly lower energy by other atomic nuclei until they have lost so much energy they are eventually released at the stars surface as visible light. This is why the sun and other stars shine. As you might have noticed, this process did not generate any carbon. That’s because the sun will not produce carbon until it runs out of its hydrogen fuel and falls off the main sequence. When a star like the sun runs out of hydrogen fuel, the radiation pressure that was holding it up against the intense gravitational force weakens, so that gravity collapses the core. This collapse has the effect of heating up the core further, and causing helium nuclei to fuse. The outer layer of the star get pushed outward, and the star will become a Red Giant, swelling many times its original size. This where the triple alpha process comes in. Each helium nucleus – composed of two protons and two neutrons – is called an alpha particle. 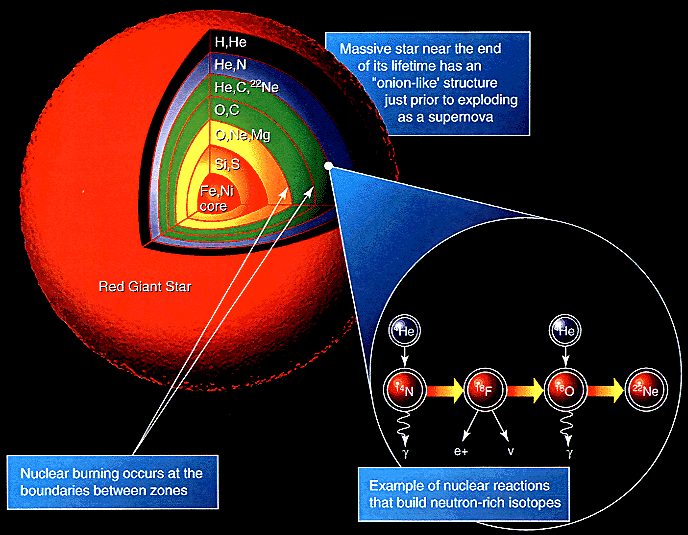 The carbon-12 (C12) has 6 protons and 6 neutrons, and its production is a two step process in the heart of Red Giant stars. In the first step two alpha particles fuse to produce beryllium-8 (an atomic nuclei with 8 protons and 8 neutrons represented as Be-8). Beryllium-8 will have a tendency to almost immediately break apart into two alpha particles, but in the collapsed core of the Red Giant star, the production of beryllium-8 is even faster than it has a chance to fall to pieces. This allows another alpha particle to fuse with a beryllium-8 nucleus and thus creates our beloved carbon-12 atomic nuclei. This seems all well and good except that the energy of the beryllium-8 nuclei plus the alpha particle is higher in energy than the carbon-12 nuclei produced. In order for the nuclear reaction to proceed the reactants and the products need to have fairly close energy levels. This means that the odds of this ever actually happening is so small as to be insignificant, and so “no carbon for you”, to paraphrase the Soup Nazi from Sienfield! Around 1953, the British Astronomer Fred Hoyle realized that for carbon to be produced by the triple alpha process, the carbon nucleus had to have an excited state that was somewhere in energy near the combination Be-8 + He-2 + plus a little extra energy to account of the kinetic energy of the two reactants. Hoyle then went on and calculated the energy that this theoretical excited carbon state should have in order to explain the carbon that is obviously very abundant in the universe, and necessary for us to exist at all. His calculation was that the excited carbon state was at 7.69 MeV (MeV = mega electron volts), and he went to his nuclear physics colleagues to try to get them to look for this carbon state. He didn’t have much luck initially convincing the physics community to look for this state, but several years later an excited state of carbon with an energy of 7.656 MeV was found that verified Hoyle’s prediction. The remarkable thing is that Hoyle predicted this state of matter based only on the anthropic principle – that it had to exist in order for us to be here to wonder about it. This excited carbon-12 state, now known as the Hoyle state or Hoyle resonance, makes carbon production in our universe possible. Because the energy of the excited carbon state is close to the energy of the Be-8 + He-2, the reaction can proceed, then lose energy settling down into the lower and more stable C-12 state. Recent studies have shown that the carbon nuclei can be thought of as clusters of three alpha particles in the way they are arranged and interact. In the stable ground state of carbon-12 (remember we are talking about the energy states of the nuclei themselves and not the energy levels of the electrons around the nuclei, as we would be if talking about chemistry) the three alpha particles can be thought of as forming an equilateral triangle with an alpha particle at each vertex. In the Hoyle state carbon nucleus the three alpha particles form an obtuse triangle, or what has been called a “bent-arm” configuration. Almost no carbon formed this way in the Big Bang because the temperature and density of the universe dropped too quickly for anything but a trace amount, at best, of carbon to be made. It had to be in the hearts of these dying stars that the process would have millions of years to accumulate the universal carbon content. The triple alpha process is one of several arguments theists have used for the, so called, fine tuning problem. By fine tuning they mean that the physical constants and other parameters of the universe are so exquisitely tuned that any adjustment in their values would have produced a universe devoid of life. In our example above, if there was no excited carbon state at the Hoyle resonance then there would be a universe with stars and galaxies, hydrogen and helium, but no carbon or higher elements, and therefore no planets, living creatures, or people. Seems like a pretty lucky coincidence – right? First, I would have to say that in my opinion, in a reasoned scientific debate, the fine tuning problem is the most sophisticated argument for the existence of a cosmic intelligence or creator being. There is already so much overwhelming evidence for evolution that the illusion of design in the living world is no longer a valid argument, and hasn’t been so for at least a hundred years. Almost all scientifically educated people will accept evolution as fact if they have not already been intellectually blinded by dogma. That still leaves apparent design in the physical world to be adequately explained. Secondly, I would conclude that the fine tuning arguments do not apply to those who hold to a literal interpretation of scripture, whether that individual adheres to the Christian bible, Jewish torah, or Islamic koran. To hold a literal interpretation would mean that fine tuning argument is completely irrelevant, as the universe, in this view, was created in a short period of time – just 6 days!, and has existed for only a short time period – less than 10,000 years. Therefore, there is no need to worry about the unlikely Hoyle resonance associated with the triple alpha process, as it didn’t take hundreds of millions of years for stars to form the carbon for us to have available for life, since everything necessary was just created when animals and humans were suddenly brought into existence. The same logic would apply to many of the other examples of fine tuning arguments, such as the strength of the gravitational constant, for instance. Again, it doesn’t matter too much if the constant is just right to account for the longevity of stars or the expansion rate of the universe, or so on. Stars were just created in the beginning, and there was never any concern that they would all collapse into black holes too soon, or not have enough gravitational force to collapse from interstellar clouds of gas and dust to begin fusion in their core. So where does this leave us then? Well, the fine tuning argument might be of use to the theist that believes the creator of the universe works through physical laws, and sets things into motion at the earliest stages of the universe. This would be most consistent with the deist, who might interpret god as the initiation force of the universe or the laws of nature itself. Once the universe is wound up it is released to progress based on the laws put in place, like a computer program being executed after the user presses “start”. Does that fit at all with an interpretation of a personal god? Again, it doesn’t seem to fit well with a young earth creationists world view. For those who can accept an old universe that operates by physical law it may be compatible, but there is nothing about the fine tuning argument that requires a personal god. If we look more closely at the fine tuning arguments we find that even there, the assumptions may be over emphasized. 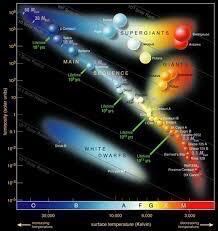 Again, it is claimed that if even one physical parameter, such as the gravitational constant, or the strength of the electromagnetic force, are varied even slightly the universe could not have evolved in a way that life as we know it would ever be produced. Several theoretical physicists, including the late Victor Stenger had shown that if you alter a particular physical parameter, but also allow other physical parameter to vary at the same time, then there can be many balances that essentially cancel themselves out. In other words, there are many more “sweet spots” that are possible for a habitable universe than the one we find ourselves living in. That means the universe is not as fine tuned as sometimes claimed. As far as the wild coincidence of the Hoyle resonance state, Stenger too showed that the excited state of carbon could vary by a lot more and still produce as much, and in some cases even more carbon than our universe is able to produce. He calculated that the excited state of carbon could have a wide range of values – from 7.596 MeV up to 7.716 MeV- to produce the same amount of carbon that we see in our universe. It didn’t have to be precisely the 7.656 MeV that we observe for our universe. In addition, enough carbon could still be formed if the energy value were up 7.933 MeV, and even more carbon may form at a range below the 7.596 almost down to the ground state of the carbon-12 nucleus. This suggests the Hoyle resonance was not terribly finely tuned after all, and therefore life’s dependance on this unusual state is not as unlikely as initially thought – a rather poorly tuned cosmic dial could still have resulted in the same conditions. Not only that, but some values of the excited carbon state may actually have made life potentially more common throughout the cosmos. If it had only happened to have a slightly lower value it would have resulted in more carbon production in stars. In that sense, our current universe is not very well suited for life. Life just barely makes it out here! It might have been better for evolving life if made by design. Can science do any better at providing an explanation for a universe containing physical constants consistent with life? In recent years serious consideration has been given in scientific circles to the possibility that we live in a multiverse of universes. In the multiverse model our universe is just one of many, possibly an infinite number, of universes. Each universe could, in turn, have their physical constants randomly set to a particular value. This would mean that there are many universes that exist in the multiverse where the physical laws do not allow life to develop. These universes may be interesting in certain ways, but would be completely devoid of any life forms. Other universes in the multiverse, would be like ours, and happen to have their physical parameters randomly set in a way that makes the development and evolution of life possible or even inevitable. Because every variation of combinations of physical parameters are manifest in some universe somewhere it shouldn’t be surprising that we wake up in a universe that is suitable for us. Even if a universe exactly like our own had only a 1 in 10500 change of occurring, it would be inevitable to occur an infinite number of times in an infinite multiverse. The truth is that no one knows for sure if we live in a multiverse. It is very important to point out the multiverse idea wasn’t invented to solve the fine-tuning problem, it was a natural consequence of existing scientific theory. Certain serious scientific theories, such as inflation theory, which describes the very early stages of our universe following the Big Bang seem to demand a multiverse as part of their mathematical structure. Inflation hasn’t been satisfactorily verified as of yet, and no other evidence has provided strong enough proof of a multiverse at this stage in our cosmic understanding. Still, continuing down the path of naturalistic explanation still seems the most prudent path to take since this approach has taken us so far in such a short amount of time. To the deist, there is nothing disproving that a supernatural force set the laws of physics in motion some 13.7 billion years ago, but as has been pointed out by others, this does not seem to be the most parsimonious explanation, since this merely pushes back the question by one step, and we are still left with the question where did such a complex and intelligent being come from. For those who demand that the creator being was always there, then the same argument can be used for the universe itself. Even if science can never answer this question – a distinct possibility – this does not mean that therefore god did it. If one theory is proven wrong that does not mean the rival theory is therefore the correct explanation. It simply means one theory was proved wrong. The rival theory may be right or wrong, but still needs evidence to stand on its own. Unfortunately, if science can never satisfy our curiosity by getting to the bottom of our ultimate origins there is no reason to think that religion can do any better. There is also every reason to feel hopeful that the discoveries of science will continue to shed some light on the origins of the universe – that we are not at the end of scientific discovery. The triple alpha process is a fascinating mechanism by which the carbon so vital for life as we know it is produced in our universe. Perhaps it doesn’t answer the ultimate question of, Life, the Universe, and Everything, but appreciating its complexity certainly adds to the beauty of trying to understand our place in the cosmos. If we did learn someday that the multiverse exists, and we are here because it is inevitable that some universes in the multiverse would be just like our own for no good reason but by a statistical roll of the dice, I’m sure that many would still feel that the ultimate question was still not satisfactorily answered. Is that because we don’t know what the question really is? Is it that we don’t know how to formulate the question so that it brings in the whole cosmic perspective plus our own personal one? 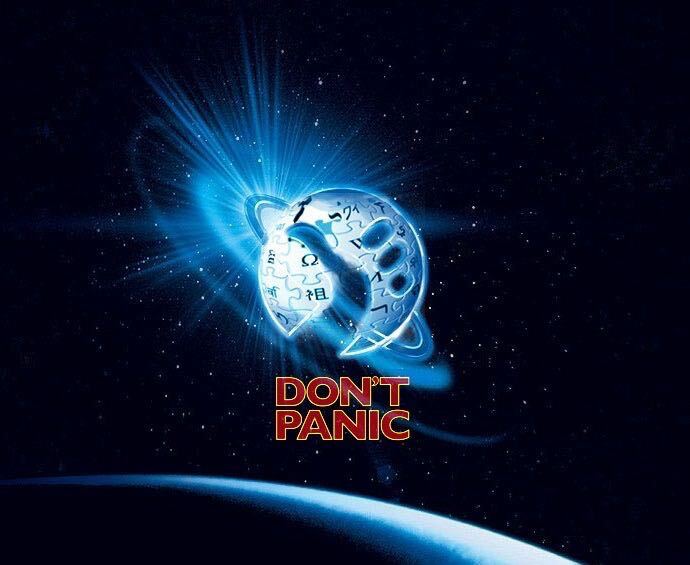 In the mean time, for those of us who value evidence, logic, and reason, while we continue to look for the answers to the deep questions, all I can offer is the advice of the HitchHiker’s Guide to the Galaxy – Don’t Panic! 1. “Is Carbon Production in Stars Fine-Tuned for Life”?, Victor Stenger, Center for Inquiry, Volume 20.1, March 2010. 2. “The Hoyle State: A Primordial Nucleus behind the Elements of Life”, Natalie Wolchover and Quanta Magazine. Scientific American, December 6, 2012. 3. Wikipedia: “The triple-alpha process”. 4. “Carbon’s Hoyle state calculated at last”, Edwin Cartlidge, Physics World, January 3, 2013. You’re quite right about Beryllium. Thank you!